Posted on 12/21/2017 by Thomas Michael. 0 Comments. A few months ago, we received a live chat on our website asking if we had a list of all SAP transaction codes – we didn’t and so I wrote a blog where you can download all SAP tcodes. This blog turned out to be the most visited article of the year – who would have known? Then recently someone asked me about this list on our Twitter feed, specifically, if our list also included the transaction codes for SAP’s newest release, S/4 HANA (it didn’t). So I went into our S/4 system and downloaded all transaction codes to an Excel spreadsheet and compared the 2 lists. As a reminder, a transaction code in SAP is a shortcut to an activity. For example, AS01 is the code to create a new fixed asset master record, FB01 lets you post a financial document or use ME21 to create a purchase order, etc. pp. You can see a complete list of all transaction codes by displaying the contents of table TSTCT – this is where SAP stores all tcodes and their description in all installed languages. It turns out that there are about 7600 new transactions in S/4 (and that’s on top of the roughly 100,000 tcodes that exist in SAP’s ECC 6 release) …that’s somewhat surprising to me – I would have guessed a lot higher. Anyway, download all new SAP S/4 transaction codes and take a look for yourself. Once downloaded, play around with it – for example, you can search for the string /ui2/ (=user interface 2) to find all new Fiori-related transaction codes quickly. I hope you’ll find the list useful and, as always, please comment below and share this post. 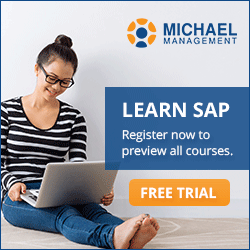 Thomas Michael is the CEO of the Michael Management Corporation – the company that killed death-by-PowerPoint training and made online SAP courses fun again. Tom recently discovered his love for eggnog and is looking forward to spending the holidays in New York City.